Optimizing stores is our business. Our DM1 platform collects the information at a level of detail and accuracy that’s unique – and does so at a cost that makes aggressive deployment in your stores practical. We bring a customized set of analytics and measurement to the table – solving real-world problems around store merchandising, promotions, compliance and associate performance. Key to our solution is that customer journeys are tracked and contextualized relative to each store; allowing you to visualize store performance naturally, trend over-time even across store-changes, integrate PoS data seamlessly, segment by fine-grained in-store customer behaviors, and run amazingly accurate A/B tests. We’ve been measuring and optimizing customer journeys for decades. Our background is in Digital Analytics. In fact, we founded a boutique Digital Analytics services firm, Semphonic, back in 1997 and grew it to be the largest independent Digital Analytics consultancy in the world. Over the past two decades we’ve had a unique vantage point to the growth and maturation of web, mobile, app and social media measurement tools and use cases. 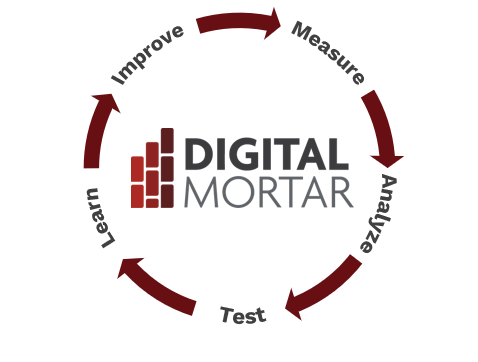 Digital Mortar was built to bring the advanced measurement capabilities that the digital world has grown to depend on, into physical retail. In 2016 we built DM1. Today, it’s the most advanced retail customer behavioral analytics software there is. And, more importantly, it will drive change and improvement in your stores. Do shoppers have to have a Mobile App to be measured? No. The more App usage the better. Mobile Apps are a great platform for location analytics and driving omni-channel and personalization. But you need to measure more than that. Digital Mortar’s DM1 platform measures the journey of every shopper with a WiFi-enabled smartphone – no opt-in and no WiFi connection necessary. Do Associates get measured as Shoppers? Absolutely not. We’ve worked hard to ensure that 1) You can measure Associate performance and 2) Associates never get confused with shoppers. How? Naturally, we’ll classify any store-owned device appropriately. But we also apply advanced algorithms to the electronic data to identify Associate behavioral signatures on their own devices. That means you never have to worry about compliance issues mucking up your measurement. Can I join In-Store Behavior to Digital Data? We call that the omni-channel join. It’s not a slam-dunk but it is possible in some cases. Keep in mind that like digital data prior to purchase, in-store location data is anonymous. To join the data you need to create a connection. You can do that in three basic ways: with a mobile app, with WiFi opt-in, or with time-based joins at POS or Customer Service locations.